Ever come across something on eBay that was completely unnecessary to your life, but felt a strong need to buy it anyway? This is one of those situations. A rare Futuro home has popped up for sale, currently listed with a "Buy It Now" price of $29,900. 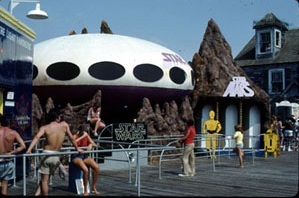 Located in Berlin, New Jersey, the structure was previously used at Morey's Piers in Wildwood, NJ as various rides (such as "Star Trek," "Planet of the Apes," and "Star Wars"). 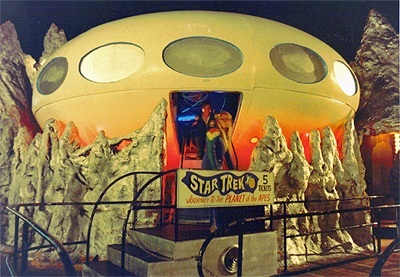 Though the signature "UFO" shape (complete with airplane hatch-like entrance) really lends itself to such a whimsical use, a Futuro home was intended for real-life use. Designed by Finnish architect Matti Suuronen in 1968 and manufactured by the Futuro Corporation (based in Philadelphia, Pennsylvania), the house was designed as a "portable" ski chalet. Its lightweight plastic exterior could be constructed quickly, and it also allowed for mass-production. 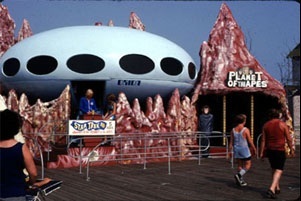 However, such virtues weren't enough to save the Futuro home from the hands of fate. When the oil crisis of the 1970s caused the price of plastic to triple, the Futuro went off to design heaven. It's estimated that about 60 have survived. Why the interest today? Retro Renovation founder and vintage home design expert Pam Kueber chalks it up to its shape. "Clearly, I think we are fascinated by houses like the Futuro because they look like flying saucers. But round houses go back farther than 1968, for sure. For example, Buckminster Fuller conceived The Dymaxion House in 1920 and built prototypes in 1945 and of course, he's famous for his geodesic domes. In 1957, Disney displayed the Monsanto House of the Future. And way before that we had -- yurts!" Now, if only we had $30,000 to spend on a shell of a home, plus the time to restore it. Any takers? h/t to The FUTURO House Facebook page and Retro Renovation for uncovering this amazing sale.